Fiddle leaf figs are popular because they provide such eye-catching beauty in a home or office. The lush, verdant leaves make a striking impact. 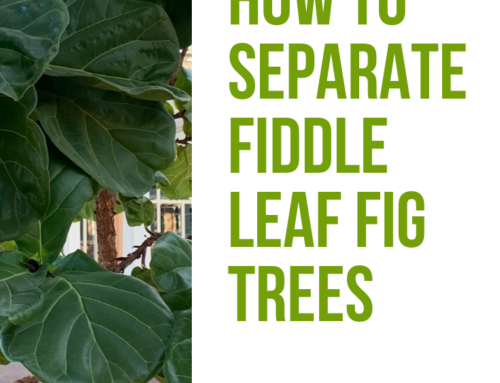 But if things go south and the leaves start to drop or get brown spots, your fiddle leaf fig may make you more frustrated than proud. Here are the keys for how to keep your fiddle leaf fig healthy, green, and gorgeous. One of the most common mistakes new plant owners make is to place their fiddle leaf fig in a container without proper drainage. Ficus lyrata need their roots to stay relatively dry and will suffer if the soil is too moist. Never attempt to grow a fiddle leaf fig in a container without drainage and make sure to let your plant’s soil dry out a bit between waterings. Read more about drainage here. 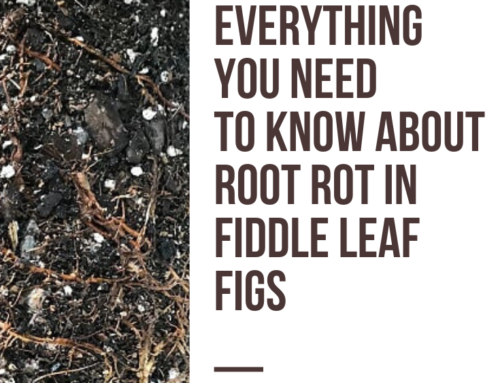 Fiddle leaf fig plants are susceptible to root rot and bacterial infections if their root system gets too soggy. To keep them healthy, use a fast-draining soil for houseplants. This provides even moisture and also aeration so the roots can breathe. 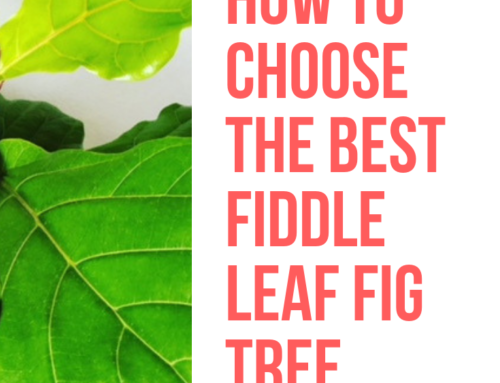 Learn more about the best soil for a fiddle leaf fig here. Originally from Africa, fiddle leaf figs love sunlight and need plenty of it to thrive. They do best next to large, south-facing windows that give 8 or more hours of indirect sunlight per day. Avoid direct sunlight, which can burn the leaves, but try to locate your plant in the sunniest area of your home. Learn more about how much sunlight your plant needs here. 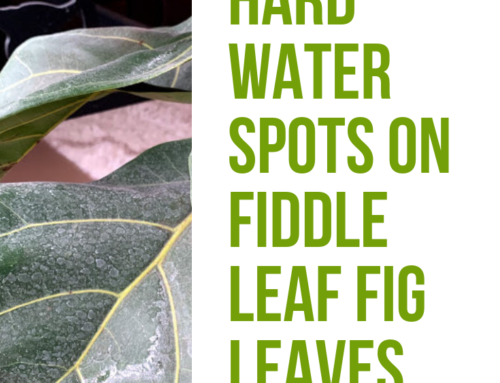 The most common cause of fiddle leaf fig death is overwatering. Poor drainage and lack of sunlight can make this problem worse. Be sure to never water your plant more than once a week and be careful not to water until the roots have a had a chance to dry out between waterings. If you’re not sure when to water, consider using a moisture meter. Read more about watering your plant here. 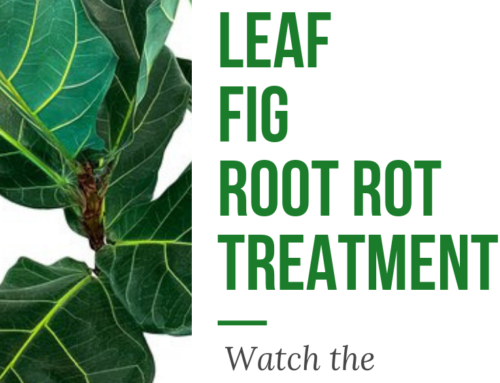 Your fiddle leaf fig’s roots need both water and air to live. In the wild, natural decomposition and earthworms are constantly aerating the soil. But when potted, the soil becomes compacted over time as you water regularly and your plant’s roots grow. This can cause your plant’s roots to suffocate. Use a wooden skewer or a chopstick to poke holes and gently loosen the soil once a month or so. With their large leaves and relatively fast growth, fiddle leaf figs have voracious appetites. Make sure you are feeding your plant on a regular basis with a good houseplant fertilizer. Any formula designed for houseplants will work, but fiddle leaf figs do best with a 3-1-2 formulation such as Fiddle Leaf Fig Plant Food, which is designed to be used every time you water your plant. Read more about feeding your plant here. It may seem strange, but research shows that bonding with your plant is critical to its health. Be sure to get to know your plant, consider giving it a name, and check in on it each week for signs of disease or stress. Plants thrive on positive energy and affection, so be kind to your plant and give it some extra TLC to help it look its best. 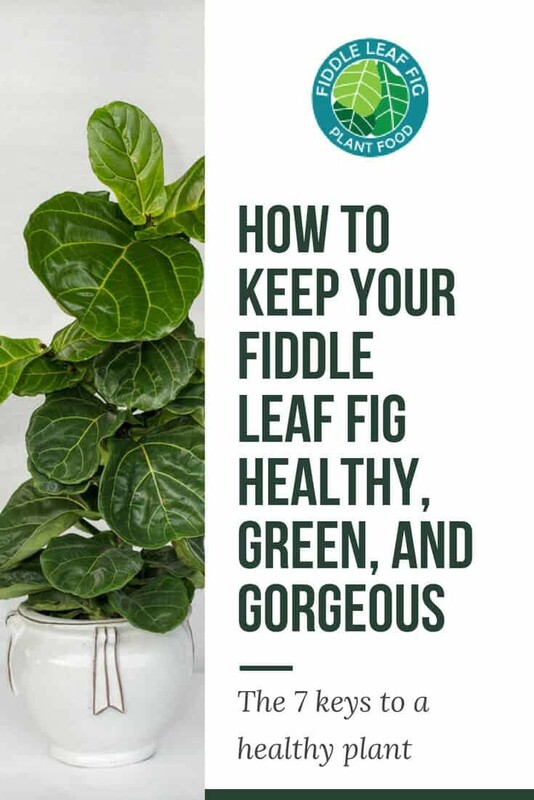 To learn more about keeping your fiddle leaf fig healthy, green, and gorgeous, read The Fiddle Leaf Fig Expert, your complete guide to growing healthy fiddle leaf fig plants. The book is available in full-color paperback or Kindle edition on Amazon now! Watch our free exclusive webinar for care tips and tricks. Finally, join our newsletter to get weekly plant care tips direct to your inbox!